Hundreds of UCSD students and faculty watched, and then cheered, as a huge crane lifted famed Korean artist Do Ho Suh’s “Fallen Star” more than 100 feet into the air and permanently positioned it on the top edge of the Jacobs’ School of Engineering Tuesday. 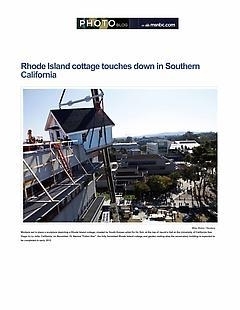 The 70,000 pound house was inspired by a house in Providence, RI (where Suh went to school after first coming to the U.S.) and will be accompanied by a roof garden open to the public upon the work’s completion in late January. “Fallen Star,” which addresses issues of space, displacement, connection and disconnection, is the most complex (in terms of engineering) and costly (approximately $1.3 million) piece in UCSD’s internationally acclaimed Stuart Collection. The nonprofit Stuart Collection has now placed on the UCSD campus 18 works by an international roster of artists ranging from John Baldessari to Bruce Nauman. “Fallen Star” was funded by private donations and a $90,000 grant from the National Endowment for the Arts. Suh, who participated in the 2010 Venice Biennale Architecture Exhibition and the Liverpool Biennial, has works in the collections of New York’s Museum of Modern Art, Whitney Museum of American Art, and the Solomon R. Guggenheim Museum. He has upcoming exhibitions in Berlin, Seoul, Seattle and Houston.